The North Side’s MacArthur Avenue. 1. The beautiful homes and yards in our neighborhoods — from the welcoming front porches of our bungalows to the charming old bricks on our Cape Cods. 2. The trees and sidewalks of the North Side invite me to slow down my busy schedule, take a walk, and stay a while in a conversation with my neighbors. 3. We are a neighborhood that not only looks out for each other, but also looks to include each other. We share potluck dinners outside; we build dog parks; we watch The Diamond's Fourth of July fireworks on Brookland Park Boulevard; and finally when a family welcomes a child, we bring them meals for months. 4. 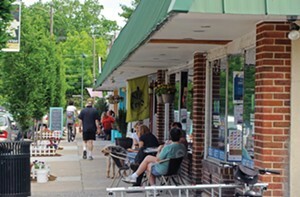 All the fantastic, locally owned businesses: Mercury Strings, Northside Grille, Nicola Flora, Once Upon a Vine, the Mill on MacArthur, Dot's Back Inn, Zorba's, Stir Crazy, Rich's Stitches, Sweet 95, Kitchen 64, and Tastebuds American Bistro are just a handful of our choices around Bellevue alone. 5. We have access to so many city resources: Bryan Park, the Pine Camp Cultural Arts and Community Center, The Diamond and more. 1. The sense of community. We've got everything from folks who have lived in the same houses for 50 years to new homeowners, hood rats, grandmas, couples, students, artists, musicians, and even a handful of anarchists and Republicans. 2. Nowhere is Richmond more beautiful than from Jefferson Park (unless it's Libby Hill or Chimborazo). 3. We might not have as many restaurants as other parts of the city, but what we do have is best in class. 4. There is a palpable sense of history — and thus of the possibilities of the future. 5. The East End is raggedy like nowhere else in RVA. New Year's is like the Old West. Life in most of the East End is not sheltered, and you gotta love it. 1. If you live south of the James, your mortgage is cheaper, and that's reason enough. 2. "There's no good Mexican food in Richmond" is something people from the "other" side of the river say. La Milpa, Cielto Lindo and the Tortilleria on Hopkins, I'm looking at you. 3. Can you even get to the James anywhere else? If there is access, I'm sure it's hiding behind knee-high depths of PBR cans. Pony Pasture or bust. 4. It builds character: Like a good schoolyard beating, proclaiming your South Side lifestyle is an indicator of strong moral fiber. It says: "I don't care what you think about my house. I like it here, and that's what matters." 5. Viva la diversitad! Living on the South Side means experiencing more cultures and languages than I'd be able to in the homogenous gentrification of the hipster Fan or the cookie-cutter West End. 1. Casey Brynildsen at Buckheads. The best bartender in town at the best-stocked bar in town, a sweetheart of a person, and the concoctor of my new favorite cocktail: a cilantro gimlet. Perfect warm-weather deliciousness. 2. A notable lack of Confederate flags. 3. A peaceful location. Doesn't have the L.A.-style traffic of Short Pump or the lack of free parking downtown, yet is close enough to each. 4. An explosion of good, ethnic restaurants such as the Balkan, El Caporal, Habañero Mexican Grill, Pegasus, and the Phoenician — to name a few. Oh, and Anokha. I love me some Anokha. 5. I can see Goochland from my house.